The words “SPACE… THE FINAL FRONTIER,” from Captain Kirk’s famous voice-over appear beneath the stamps against a background of stars. The stamps were designed by Heads of State under the art direction of Antonio Alcalá. I came home today with a promotional mailing from the United States Postal Service. The mailing told me about their domestic priority mail flat rate directing me to a website, but as you can see in the pictures below, it’s branded with Spider-Man. The post office has teamed up with Spider-Man to promote themselves as well as The Amazing Spider-Man 2‘s opening on May 2. That opening date was pretty clear on the front of the insert in the mailing. The United States Postal service will be releasing a set up stamps in 2010 depicting some of your favorite characters from the Sunday comics. Beetle Bailey, Calvin And Hobbes, Archie, Garfield and Dennis The Menace will all be receiving the postage stamp treatment. Dubbed the “Sunday Funnies” line, the stamps will debut in July this year. 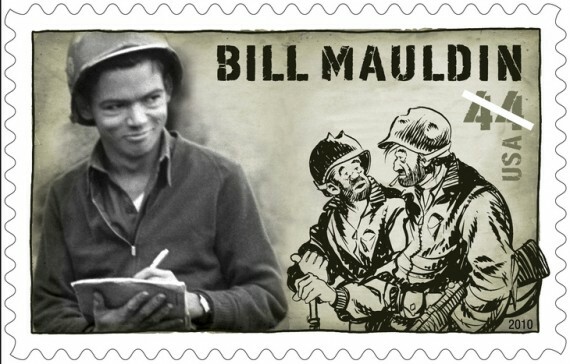 Also Bill Maudlin, a war time cartoonist whose work Willie and Joe educated audiences stateside about life in uniform, will also be receiving a postage stamp. Maudlin received a Pulitzer Prize for his work.